In 1983 Justin BUA, a young break dancer and artist of the streets, tuned in along with the rest of the the world to watch the much anticipated reunion of the Jackson 5. After a few songs and roars from the crowd, Michael Jackson dressed in black and sequins was left on an empty stage, as his brothers stepped back into the wings. And in a brief moment, Michael metamorphosized in front of all of our eyes. The hat slid on, the arms threw back, and an electrified body moved to a new beat, in a way most had never seen before. The Michael we once knew was gone and the Michael we would come to know was born on stage to a sea of cheers. He caught the world off guard and in an instant everything changed. The move most of us saw for the first time that night, and would come to know as the "moonwalk", was also known long before to BUA, coming from a small but quickly growing movement from the streets of NY as the "backslide". For a few years Break dancers / B-boys had been perfecting those moves, DJ's and MC's had been defining the music that drove them, and artists with spray cans in their hands were giving it color. In the tradition of the King before him (Elvis Presley), Michael had brought to "main street America" and even the world, the art of people who up to that point did not have a path to get in front of the world's eyes and ears. 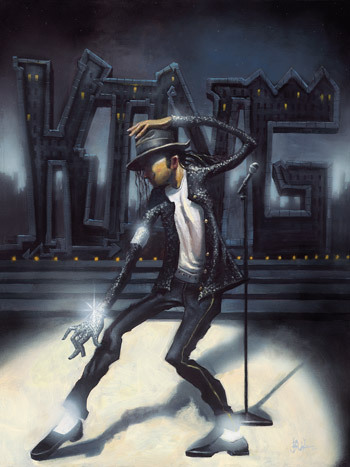 In a very real way, Michael Jackson led the way for a generation of urban art forms. The very same urban world that years later BUA would become famous in his own right for capturing. Much in the same vein as Michael, BUA would go on to develop the polished skills of the masters and would use them to shine a spotlight on the original characters and places that defined the urban scene that one day would spread to every corner of the globe. BUA as you would imagine, has felt a close kinship to Michael over these many years. And as such, Jackson's early passing has had a profound impact on him, as it did for millions world wide. But as artists will often do, he has embraced it, by offering the most appropriate gesture he could as an artist. 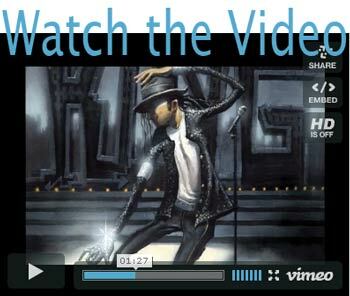 BUA went to his easel and expressed a raw and moving homage to a personal idol, the King Of Pop.